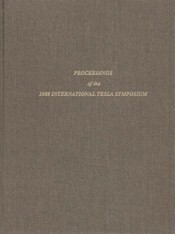 A collection of papers delivered at the 1988 Tesla Symposium in Colorado Springs. Speakers included N. Pribic, R. Maglic, E. Rauscher, B. DePalma, J. Moray, G. Hathaway, and C. Spaniol. The general topics were: The Life and Times of Nikola Tesla; Tesla Coil Theory, Construction and Applications; Advances in Gravitics; and Advances in Electromagnetics. Click here for a list of published papers from the 1988 Colorado Springs Tesla Symposium.